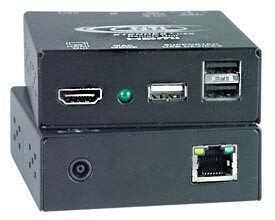 The XTENDEX® HDMI USB KVM Extender provides remote KVM (USB keyboard, USB mouse and HDMI monitor) access to a USB computer up to 300 feet over CAT5/6/7 cable. Each ST-C6USBH-300 consists of a local unit that connects to a computer, and a remote unit that connects to a keyboard, monitor and mouse. The local and remote units are interconnected via CAT5/6/7 cable. Available with an optional female USB Type A connector for an additional USB 2.0 (low/full speed) device – USB touch screen monitor, CAC card reader, interactive whiteboard, or barcode scanner. Supported touch screen monitors: Microtouch 3M, ELO 1529L 3000 Series, ELO 3202L, Smart Podium ID422w, Hope Industrial HIS-RL17, NEC MultiSync E222W, Industrial Electronic Devices Inc IWS-240t-G3, Zytronics CML-170, Lenovo L12341 and HP Compaq. How to extend remote KVM access to a USB computer up to 300 feet over CAT5/6/7 cable.